A couple weeks ago, I wrote an article about the importance of listening. Thanks, everyone for the really excellent comments on that post! You helped me realize that I forgot to discuss a very critical point: how to listen effectively. Read more for some helpful advice! One of the major hurdles when first starting a new foreign language is that it sounds so foreign! In the very beginning, it can be helpful to passively listen to the language even if you don't understand anything. You will become more familiar and comfortable with the sound of the language. Later, when you really begin to learn it won't seem as strange. But after that initial stage, passive listening isn't enough! You need to have a method for actually understanding what you're listening to. This is called comprehensible listening. 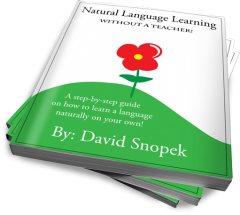 I've talked very little about language learning theory on my blog. But the latest research says we naturally learn a second language by actively consuming comprehensible input (meaning reading and listening). This is a big topic, which I'll write more about in future articles. What's important now is: You only learn if you can understand or have a method to understand what you are listening to or reading. Does that mean you should only read and listen to texts that are very easy? Nope! You want material that is a little too hard for you. If it's too easy, then there is nothing you can learn from it. But how can you understand something that is too hard for you? You need a method! There are many methods and which one you decide to use will depend a lot on personal preference. Here are only three examples. If the text you are listening to contains 80-90% structures and vocabulary that you already know, you can probably guess the meaning of the rest from context. Unfortunately, it can be very difficult to find an appropriately difficult text for your level, especially when you're on a lower level. The texts found in most language text books are graded, so that they get progressively harder. But they also tend to be artificial and boring. This is a lot easier for advanced learners. Once you've reached that level, you will already understand 80-90% of most texts that you encounter. That said, some people actually prefer to use only context because they believe it is the most natural method. Using a transcript of the audio in the same language is my favorite method. When I don't understand something in the listening, I can look at the transcript and look up any unknown words or structures. This is basically what I did with the Harry Potter books. I always bought both the audiobook and paper version. I tried to focus on the audiobook as much as possible while using the paper book as a transcript when necessary. It's also relatively easy to do this with movies and shows. There are lots of websites where you can download the subtitles which can act as your transcript. Song lyrics are also usually easy to find. Some podcasts transcribe their episodes. And so on! This technique can be used anywhere you can find a suitable transcript. Some people prefer to work with a translation of the text into their native language, as a means to understand it. For example, instead of looking up unknown words in the dictionary when I was listening to Harry Potter, I could have checked the English version. There are even bilingual books where the page on the left is in one language and the page on the right is in the other. Or other prepared learning materials. I don't personally like this method because I prefer to keep thinking in terms of the language I'm learning rather than going to a full translation into English. Good translations also tend not to be literal. Sometimes it can be difficult to see what parts of the translation connect to the original. And, of course, in many cases it's harder to find a translation than a transcript. What do think? Is understanding what you are listening to important? What method do you use to help you understand what you are listening to? Write a comment below! Nice set of ideas for listening. I didn't understand where to find websites to download subtities. Could you give me an example? There are lots of websites where you can download subtitles. Just try googling for "subtitles". Watching movies in foreign language is a great idea - it can be very entertaining and, unlike books, even if you understand little you can pretty much understand what's going on and keep on watching. Also - it's great for learning words from context. In a way you learn almost organically - hearing language and connecting it with a situation. I once wanted to try improving my French watching movies with subtitles - without them it gets too frustrated, when you don't comprehend a word you cannot even check it in dictionary. Sadly, it appeared soon that there are NO French subtitles for any movies in French. And I had chosen really most popular ones with Louis de Funes. Frenchmen really do anything they can too make learning their language repelling. Heh, yeah. When ever I see medical shows, even in my native language, I just ignore all the medical terminology. :-) Thanks for sharing your experience! Great post and great list of suggestions. Are Polish audio books readily available for you there? I am looking for Turkish audio books but havne't looked hard enough yet. That would be my desired method. I love listening to audio books. Parallel texts are good too. I just released a Turkish/English guide and am preparing to publish the Polish and hopefully the Polish/English guide soon. Keep up the great work here. Yes! There are lots of places to find audiobooks in Polish online. In the past I ordered physical audiobooks (ie. on CDs) but that was a pain because they took so long to get here from Poland and I had one instance where they were lost in the mail. Since then, I've been buying them in purely electronic format so I can just download them. The last two audiobooks I got from audioteka.pl but I've used other sites too, which I can't recall at the moment. There are also a number of well-known Polish sites (one named after a certain domestic rodent - Poles will know what I mean ;-)) where you can download pretty much any book or audiobook for free. Of course, this isn't exactly in line with copyright which is why I don't recommend it. Anyway, there must be equivalent sites for Turkish audiobooks!